Longs Peak is perhaps Colorado’s most famous and traveled mountain, and for good reason. Longs offers a variety of routes in many difficulty levels. Almost every one of Longs’ routes are classics. From the class 3 ultra-popular scramble of the Keyhole Route to the mixed snow and rock mountaineering masterpiece Kiener’s Route (II 5.3 Moderate Snow) to the alpine wall classics of the Diamond like the Casual Route (IV 5.10a) and Ariana (IV 5.12a). 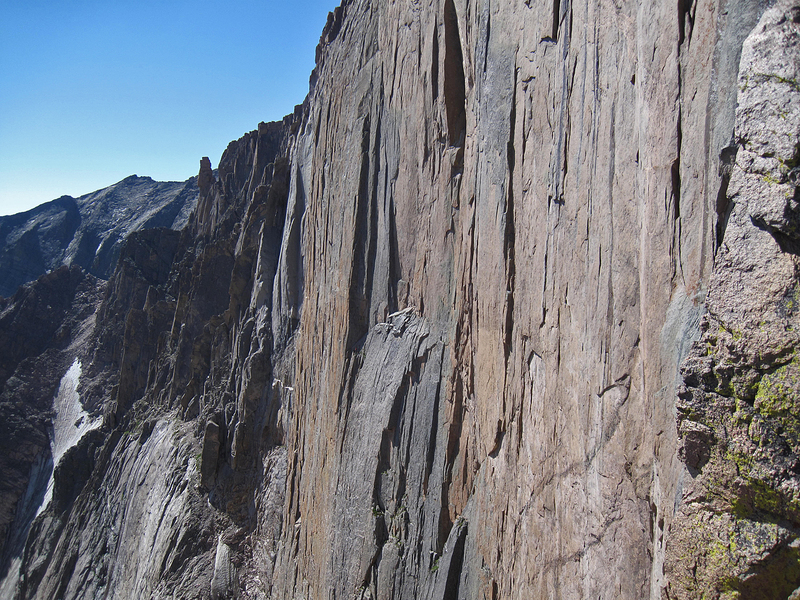 These are only a very small sampling of the many established routes on Longs Peak. Situated in Rocky Mountain National Park just northwest of Estes Park, Colorado, Longs Peak bears a high profile. It is visible from many Front Range vantages. 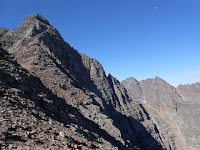 The classic cirque of Longs' and neighboring Mt. Meeker’s east faces forms one of Colorado’s iconic mountain profiles. This amazing set of vertical cliffs and steep buttresses is visible from Highway 7 far below. No mountaineer can stare up at Longs’ elegant features and not be filled with wonder. From the intersection of Highway 36 and Highway 7 near Estes Park, follow Highway 7 south for 9.2 miles to the Longs Peak Trailhead. There is a campground here with about 25 sites, though it is often full. Unless you arrive at the trailhead very early, you may find the parking lot also full. By late morning cars line the road for a half mile or more down from the parking lot. The last time I climbed Longs we arrived at 1:30 in the morning and the lot was nearly empty. This trailhead is the main access for most of Longs Peaks most popular routes including the Keyhole and all routes on the Diamond and the East Face. The Keyhole Route is Longs easiest and most popular route. Many thousands of hikers and scramblers do this route every year. Although it is a non-technical route, the class 3 terrain requires the use of hands for balance and upward movement and the rock is loose, and quite exposed. Snow or ice in the spring or storms in the summer can make this a serious route. The loose rock combined with the exposure and sheer volume of people on this route have made it one of the deadliest routes in Colorado. It seems that more deaths occur on this route than any other in the state. 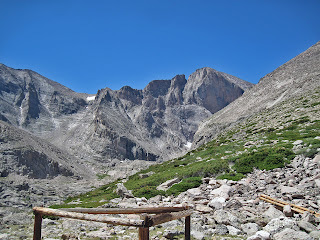 From the Longs Peak trailhead, follow the trail for 6 miles to the Boulder Field at 12,800’. Cross the boulderfield aiming for a keyhole shaped notch in the cliffband on the right (west) side of the north face. The main flow of the trail and most cairns will lead you to this obvious notch. Once you cross through the Keyhole the nature of the route changes and gets much more difficult and exposed, making this a good place to turn around if the weather looks like it is turning. After the Keyhole scramble along increasing exposure to the Trough, a long gully littered with loose rocks and the occasional class 3 move. Ascend the Trough for about 500 feet and pass a chockstone on either side. Many consider this the most difficult move on the route. Past the Trough continue along the Narrows, a skinny ledge that pinches in several spots to 5 feet or less above a three-hundred foot cliff. The climbing is exposed but easy. Reach the bottom of the Homestretch at the end of the Narrows. 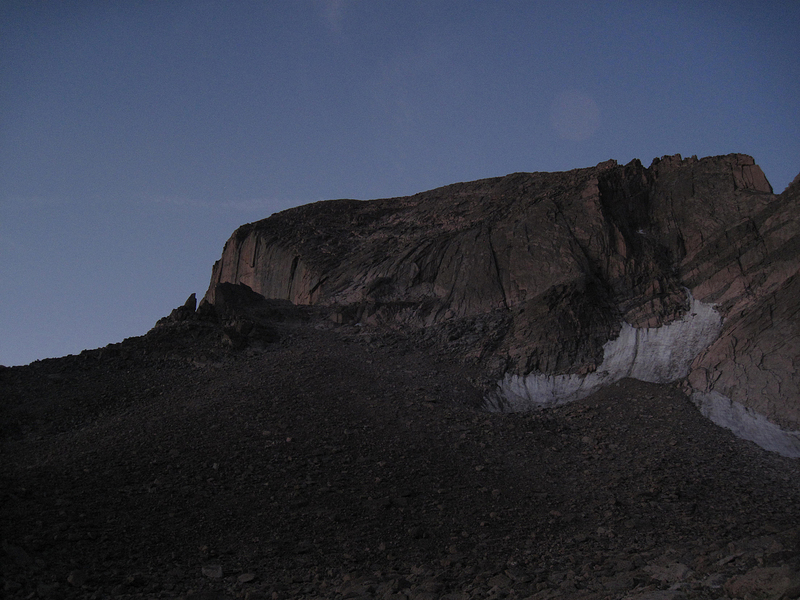 Climb a ledgy crack system and arrive abruptly on the flat summit from the south side. Kiener’s Route is a spectacular alpine journey that tackles Longs’ amazing East Face without taking on the Diamond directly. 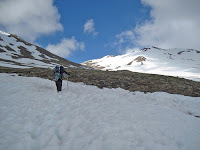 It is long, exposed and difficult and requires knowledge of both snow and rock climbing. Despite its modest technical rating, Kiener’s is a committing route that is not to be taken lightly. Approach this route with respect. Follow the Longs Peak trail for 3.5 miles to the turnoff for Chasm Meadows. Leave the main trail and take the turn left towards Chasm Lake and Longs Peaks astounding East Face. Hike for another mile to Chasm Lake; with the Diamond and the Lower East Face towering above you, you know you are in a special place. Hike around to the back side of Chasm to Mills Glacier (more a permanent snow field) and find the Lamb’s Slide, a steep couloir that ascends toward the Loft. Ascend moderate snow here for nearly a thousand feet. Conditions at the Lamb’s Slide can vary from good snow to steep rotten ice. Depending on which you encounter you may need either pickets or ice screws or both. Crampons and an ice axe are highly recommended. Ascend Lamb’s Slide to where Broadway’s ledges intersect on right. Take the highest ledge. Hike along Broad way with increasing exposure until you reach the first of the route’s crux moves, a very narrows step around with dramatic exposure over the lower East Face. Many people choose to rope up here. Past this move continue to the base of the Notch Couloir. Climb the Notch Couloir for about 40 feet and traverse right to a dihedral or pass the base of the couloir and climb rock on its right side. Either way you will encounter a pitch or two of low 5th class climbing. After passing a chimney, continue along the face staying near but not right on the edge of the Diamond’s upper edge. The exposure continues to be amazing. Near the top do a step-around near the Diamond’s apex and continue up easy scrambling to the summit. Descend with some rappels down the North Face route or scramble down the Keyhole to descend. 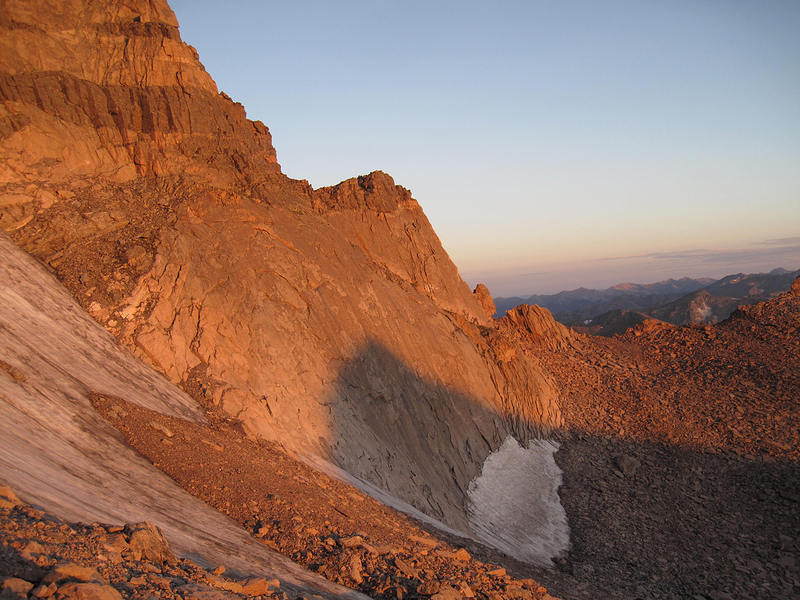 Along with Wyoming’s Grand Teton, the Diamond on Longs Peak’s east face is the most sought-after destination for alpine climbing in the Lower 48. Being the easiest way to ascend this amazing thousand-foot cliff, the Casual Route is justifiably popular and classic. Follow the Longs Peak trail to Chasm Meadows and take the turn to Chasm Lake. Hike around the back of Chasm Lake to base of the obvious cliff, the easy part of the approach is over. In the center of Longs’s East Face, located the North Chimney, a weakness that leads up to Broadway. Scramble, simul-climb and belay up three to four rope-lengths of moderate but notoriously loose 5.easy to 5.6 climbing to Broadway, an obvious ledge system. Now you are at the base of the climb. P2- Follow a nice crack (fingers to hands) to a possible belay stance below the infamous “flakes traverse”. Some people stop and belay here and some prefer to link and the next pitch together (5.9). P3- The infamous traverse. Climb up and left on good holds with somewhat scant protection. It is often said that both leader and follower are on the sharp end on this pitch due to the fall potential and traversing nature. (5.7). P4- At a spacious ledge, gain a good handcrack dihedral. Climb a long pitch to a stance near the top of the dihedral. (5.8+). P5- Finish the dihedral and belay from the Yellow Wall bivy ledge. (5.8). P7- Traverse up and left along the Table Ledge to Upper Kiener’s Route (5.8). Follow Upper Kiener’s to the summit. Descent: With ropes you can scramble down the North Face to a set of eyebolts. Two or three single rope raps lands you at a brief downscramble to the Boulderfield. You can also scramble down the standard Keyhole route.